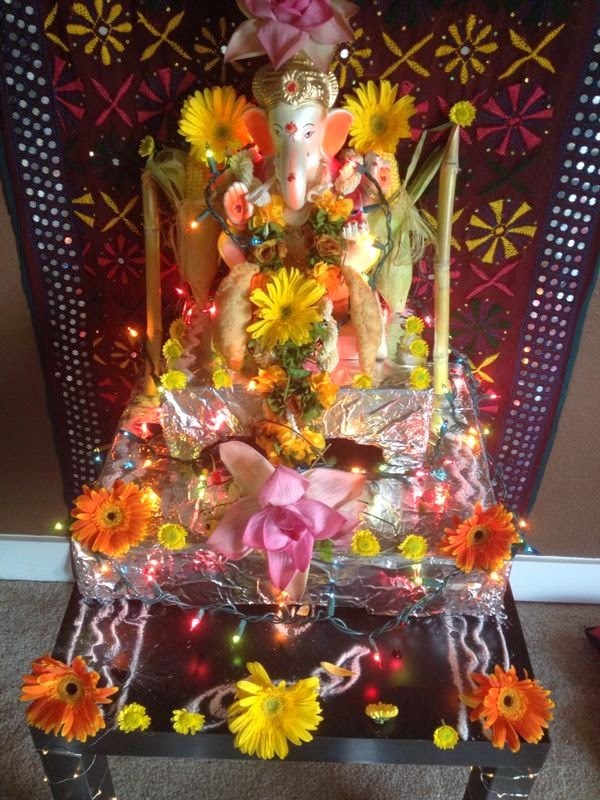 Home / Local Events / Mixed Bag / Ganesh Chaturthi ! Nalini & Ajay : Wonderful Hosts ! Neelu and Ajay read out the ganesh katha ( Story of birth of Lord Ganesh). We all sat around them and listened curiously like small children. After that everyone was busy talking with everyone some new friends exchanged names and formal details and old friends digged deeper. Women discussed clothes, jewelry, recipes all along cracking jokes and giggling, occasionally burst out laughing loudly in sync thats when men took a break from their work/sports/technology discussion and gave us a stare. Everyone lost in their own world ! FYI: That's Neelu with her son Aviral who captured these moments perfectly ! Nalini is getting her nails painted and Mr. R is just being himself ! Festivals make me miss my family more . I am fortunate to celebrate Ganesh Pooja with lovely people. They made me miss my family a little less. Loved cooking for all my friends who are my family now .May Lord Ganesha bless us with health ,wealth and lots of lovely people who bring strength and happiness in our lives . Ananya, You did have a nice celebration. Thanks for sharing the pictures. Happy Ganesh Chaturthi ! Belated ! Wonderful photos!! Glad you all had such a great time! Looks like a great family get together... Pic number 8 is well timed! Thanks all for your wonderful comments, appreciate your time !